Brian McLaren’s new book (A New Kind of Christianity: Ten Questions That Are Transforming the Faith) has just been released, and it’s already causing a bit of a firestorm. I’m still awaiting my copy, but plan to look through it at his ten questions and interact with those once I’ve been able to consider them in more detail. In the meantime, there are a few things upon which I really feel the need to comment, and since I have a ready-built platform, there’s nobody to stop me. I apologize for the length of the post — I went back to see if I could split it up into two parts, but it just doesn’t work very well to do that. It’s long, but I think it’s important. Thanks in advance for bearing with me, and reading on. And if you get bored, skip down — I summarize at the end. Now, some of the early reviews I’ve seen of Brian’s latest book suggest that we should have stopped reinventing after A New Kind of Christian rather than pressing for A New Kind of Christianity. It seems the book is Brian’s most controversial one since The Last Word And The Word After That. After Last Word, he took some heavy criticism from evangelicals and other conservatives not part of the Emerging Church Movement. This time around, the criticism is starting on the inside. But that’s just lead-in, at least until I get my own copy for review and determine whether I think Mr. McLaren has gone off the reservation or not. For now, this is about the conversation itself rather than the contents of the book… though I’ll start with some of the early book reviews. After outlining his initial disagreements with the book, Bill Kinnon rounds up a list of Reviewers Reviewing McLaren’s A New Kind of Christianity. Brian McLaren’s one-question fundamentalism quiz got him in trouble with Scot McKnight. Brian’s post was based on a short video of Seth Godin describing his notion of fundamentalism. In the context of Seth’s definition, the quiz makes sense, but perhaps not in the context of the usual definition of fundamentalism. One might go as far as to suggest it’s a dichotomy between open or closed-mindedness. Brian is suggesting his book is really only for the curious open-minded person. And that’s fair. Unfortunately, the quiz paired with a misunderstanding of some comments by Doug Pagitt placed alongside an Ooze.tv video with Brian has led a number of folks to conclude that disagreement with Brian (or other Emergent writers) meant that there was a presumed problem with the person voicing the disagreement, allowing the concern to be written off or dismissed in some way. I’m not certain this is actually happening, but based on reviews of the book and my own consideration, I’ve realized two things. (1) Brian’s New Christianity seems to be reinventing the faith at a foundational level, that of presupposition. As Daryl Dash points out, this makes it difficult to engage with the book in a way that disagrees with its content, since the response is not built on quite the same foundation, but at best, different interpretations of it. This seems to be the case with the cross in Brian’s book, for example. And put another way (from the video), if you don’t like the book, that’s okay, you’re not the book’s audience, you’re not one of the people [they’re] trying to help. I suppose that’s fine to a point, but if you have a concern about something that’s being presented to the people they’re trying to help, it can leave you feeling a little out in the cold and unable to dialogue properly. I don’t think that’s necessarily the intention, but the manner in which the faith is being re-framed from the suppositional level and the way in which the audience is defined would certainly have this effect, particularly when aligned with the perception (rightly or wrongly) that once would be entering such a dialogue with an Emergent party who thinks they simply “don’t get it”. (2) Brian McLaren is less prone to having his ideas sound offensive when he’s speaking than when he is writing. Perhaps one mode has a more clear explanation, which would explain the apparent incongruity. If this is the case, I would want to presume that the written McLaren is more accurately presented than the off-the-cuff spoken McLaren. Some allowance would of course be necessary for spoken explanations of written work, or explanations of written work that has been misunderstood. Though after whatever number of books he’s up to by now, one would expect a high degree of accurate explanation would be found in the latest books so that spoken re-explanations would be less important. And then there’s Jeremey Bouma’s post, Goodbye Emergent: Why I’m Taking The Theology of the Emerging Church To Task. Of course, we note he’s not the first nor will he be the last, though in that genre, the posts by Andrew Jones and Sarah Bessey are certainly worth reading to get a flavour of what’s going on. Although most of these partings are theological (“new theological emphases and sectarian attitudes towards church emerge”), some have to do with praxis (“So much for flat hierarchy, community and transparency”). At the end of the day, it’s a case of those representing/represented by Emergent Village morphing into something other than what was hoped for by those who are now distancing — “other than” in terms of either theology or praxis. Most if not all of the departers are framing it as not being a break in relationship — which is a point to keep in mind for a minute or two. You can follow the comment threads on most of the recent posts that I’ve just linked and find that they are long and at times heated. Following on those comments, The Ooze‘s Mike Morell has written a thoughtul post On the McLaren Nay-sayers and David Fitch has offered some thoughts on The Incarnational Approach to Leading in Our Disagreements. And you don’t have to dig very deep into the comments to discern that we’ve got some pretty big disagreements on hand. And it’s so bad that even the anti-emergents have noticed. Maybe we really do need to watch what we say or how we say it. Jamie Arpin-Ricci tackles the subject very well, and Jordon Cooper wonders about Theological Debate as a Blood Sport. Yes, there ought to be a better way to handle this… and but we might begin with thicker skin, less defensiveness, respect for the party being critiqued, and a much more cautious way of saying it. One thing that would help is some clarification concerning the relationship of the Emergent Trinity — that is, Brian McLaren, Doug Pagitt, and Tony Jones — to the Emergent Village organization. While none are listed as current EV board members, all have been in the past, and all remain associated with EV in the public eye. When one of them proffers a theological idea, it extends through that association to EV — rightly or wrongly. While it may be said that they don’t formally speak for EV, the fact that EV has historically not responded to affirm or deny such ideas leaves a de facto association with their theology firmly intact. Despite the fact that this “first generation” of EV leaders isn’t listed as formal board members, it would be difficult to imaging the cessation of important friendships, conversations, and mentoring relationships between the past and current generations (with the exception of some of the first generation who seem to have distinctly become a little distant from the current one). So does the theology of this Emergent Trinity fairly represent the majority of people associated with EV? We don’t know. Although characterized as a conversation, it must be noted that there are precious few voices within EV who are publicly disagreeing with any of the theology being promoted by this Trinity. If one were to gather up the theological threads that have been found objectionable and roll them into a single package, it would indicate that Emergent™ denies original sin and the concept of sin in general, doesn’t hold the Bible as fully authoritative (or inspired, really), denies hell, doesn’t fully articulate a model for atonement (as long as it isn’t penal substitution), is panentheistic, and cannot affirm the traditional creeds — to name a few. To be clear, this wouldn’t be a valid codification of Emergent™ theology… but stringing it together like this makes it (a) obvious why there’s increasing push-back to the varied theologies that are being offered, and (b) much more glaring that there’s no discussion that includes push-back from within the Emergent Village association. While not specifically stated, this confusion must be a complicating factor among those who have left their association with EV, and the exodus has left many people asking if the emerging church is dead. It would seem evident that the answer is no, not yet — the point that Jonathan Brink attempts to make on the EV blog. He says that, in fact, it is maturing. I think he’s correct in the bottom line of that assessment, mainly because it’s precisely what I began to see at the beginning of October 2008 (Emergent Terminology: It’s Not About Terminology) and outlined more clearly in April 2009 (Emerging Fractures & the Great Emergence). So yes, you heard it here first. And yes, we’ve got fractures happening, which yes, reflects a maturation process for the emerging church. It shouldn’t have to get ugly though, and some of the lines are being drawn a little heavily with a quick labelling of the parties. I suppose it should be carefully noted that it’s a separate question to ask whether the emerging church is dead (no) than to ask whether Emergent™ is dead. People may tire of the emerging church conversation, but for the most part it’s Emergent Village that they’re distancing themselves from, even as they continue in an emerging/missional vein of theology and praxis. Nickname for a character in The Matrix trilogy of movies. Thomas A. Anderson (Neo) was born 11th March 1962 in “Lower Downtown, Capital City, USA,” son of John Anderson and Michelle McGahey, he attended Central West Junior High and Owen Patterson High. Thomas Anderson is one of billions of humans neurally connected to the Matrix, unaware that the world he lives in is a virtual reality only. In his legitimate activities, he is a programmer, but he is also a computer hacker (cracker), in the course of which he learns of “The Matrix”, later described as a vague notion that Neo has felt his whole life that “there is something wrong with the world”. While I can relate in many ways, that’s not the “Neo” I was thinking of. 1. a combining form meaning “new,” “recent,” “revived,” “modified,” used in the formation of compound words: neo-Darwinism; Neolithic; neoorthodoxy; neophyte [Dictionary.com]. 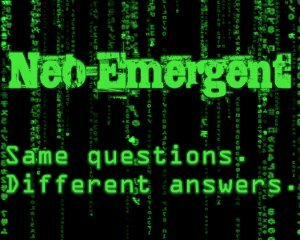 I remember thinking it a compliment when I was first labeled “neo-pentecostal”, and I’m wondering now if the best descriptor I could adopt might be Neo-Emergent. After all, I’m asking most of the same questions as the Emergent Village crowd — it’s just that in so many cases, I’m getting different answers. Most of the answers I’m getting align more closely with the missional conversation, and it’s been this way for a while now. “Missional conversation” having now been described by someone in the Emergent Village circle as the “missional right.” And perhaps the missional conversation is generally to the right of the Emergent Village one, but it’s still left of a lot of evangelical ones… with overlap on both sides, of course. Such is the nature of a fragmenting conversation that is continueing to splinter into smaller conversations. Think of these more as “working groups,” because honestly, it was probably harder to get a lot of work done in the midst of such a large conversation. The smaller ones are often focused more on praxis… on getting some work done. So the Emergent/emerging church conversation is fracturing. It’s a sign of maturation as people beginning the reconstruction process and are not comfortable reconstructing their theology in quite the same way as some of the people with whom they were very comfortable deconstructing it. Deconstruction requires a lot less affirmation of the same facts than does reconstruction. Simple fact. As Mike Morell quoted me from earlier this year, I really am sad that people who shared a pulpit at the beginning of the decade won’t share the time of day at the end of it (or however I put that). I’m not particularly sad that their theology has diverged — that simply is what it is, and was always inevitable. What saddens me is the treatment of the other. The more I’m around this emerging/missional conversation and meet some of the “big names” within it, the more I find tales of sin, mistreatment, broken fellowship, and even grudges. This deeply saddens me, not because it’s in any way unique, but because it’s no different than the rest of the church, or the world. There are things in which some parts of the body of Christ fails utterly to distinguish themselves, and this is one. And it’s hard to assign blame here. Some have distanced themselves graciously and quietly from EV, while others have become vocal critics. This has left the latest round of distancers and those sympathetic with them feeling a slight cold shoulder from EV. I have nothing concrete to point to in order to justify or substantiate this feeling, but I feel it and it seems to be a feeling that resounds with people on the fringes of EV. Whether this is real or imagined, intentional or not, it’s a little difficult to fault Emergent™ entirely for any feelings of apprehension based on the track records of those who became vocal critics. No names mentioned, *cough* *markdriscoll* *cough* but feelings of betrayal on both sides wouldn’t likely be a mischaracterization, though such a conclusion is in my view just wrong. Lots of emergent people are starting to argue about theology. It’s because of divergent paths, but some of the conversation feels less welcoming. The emerging church conversation is fracturing, but it’s a mark of its maturation process. I told you, like a year ago, that all this was coming. Don’t look so surprised. If you want to know what each of these means, well, you’ll have to skip back up and read some more. What do you think on each of these points? Am I on or off the mark? And are you Neo-Emergent? But I don’t know how it could be any shorter. Well said. As always, you have the ability to articulate what many of us were feeling. I wonder what would happen if we could manage to truly live with open hands (that is, transparently and vulnerably)? Actually, I guess I was non-Emergent when it started, but was involved with pre-Emergent when it was just emerging, so I guess that makes me post-pre-and-non-Emergent now. So, perhaps Sir Brambonius can add those to his lists of confusion to add to diffusion. Meo-Emergent? Me too, I suppose. I’ve had a series of posts at my blog the last couple of weeks reflecting similar themes. Here’s what I’m seeing as the trend leading up to this. Emergent was reactive against the dominant form of Evangelicalism. In this they moved away from the usual “leaders” and proposed alternative forms of community and mission. People from all kinds of theological places were able to find a common unity in what was essentially an ecclesial reform movement that took more seriously, rather than less, the whole testimony of the Gospels and all of Scripture. Over the last year especially, however, there has been a strong upsurge going on in the background, and increasingly in the foreground, as progressive theologians have tried to equate emerging theology with progressive theology. Suddenly non-emerging voices are coming into play who are bringing in their old issues and battles, and as they were in the battlelines in the old Liberal vs. Conservative fights of the last however many years, there is an increasing line being drawn. Lines which have, in essence, very little in fact to do with actual emerging church ideals. Now, that’s not to say that I think these lines should be kept up and no conversation should be had. I think there’s a great new chance to listen to all sides of the various theological spectrum. Progressive theology should have a voice and instead of being dismissed there should be conversation and discussion, even if not always agreement. However, to say this new trend of incorporating conventionally liberal theologians as being themselves emerging voices is fairly offtrack. In other words, I think you’re keeping to the core of what prompted the emerging conversation in the first place. And there’s a whole crowd of people who are wondering who all these people on the fringes of emerging, or who have wandered to the fringes, are really about. Emerging is emerging, it is not repackaged church growth, updated seeker sensitive, diluted evangelicalism, deconstructed pop spirituality, nor is it rebranded progressive theology. There are intersections, but we reach out in a lot of other directions with a lot of other priorities than to change Christianity into a non-new model that has had its chance to shine for quite a long while without great success in depth or reach. If neo-emerging is the name for those like you, like us, who are sticking to the original motives of emerging church and want to stay on track with progressing towards a better realized conception of what the Holy Spirit has been doing, is still doing, and will continue to do then I’ll sign up. But, I might keep fighting still for the non-neo “emerging” label not to be co-opted. Bill, a very good point. I think, for me, I never approached emerging church stuff through those forums, and remain very much an outsider to them, so I don’t think about it. But it’s true. The Movement as it is has to include a discussion of what you mention. The Evangelical Machine and the Progressive Hordes reflect Modernity in a lot of their approaches. …silly me, I posted a comment on the new, or is that neo, blog. LOL ;^) What does one expect with from an AbiSomeone, eh? I thought one of the points that impacted me most in “A New Kind of Christian” was the compulsive need of modernists to label things/people and draw lines in the sand. I felt hopeful that the emergent umbrella/tent would be big enough for everyone who want to dialogue for the sake of the church in a post modern world. Looks like it isn’t and is falling into some of the same holes that the modern church fell into which caused us to find ourselves looking for a new thing in the first place…. Whew!!! that’s a lot words. Good words as we navigate forward I hope. Neo!…who would have thought. Some of what Patrick wrote really resonated with me. I think there has been too much reactionary thinking – reaction against conservative evangelicals. There’s always a lot of danger in getting defined by what you are against rather than what you are for. Most of the basic substance of Brian’s past books (I have only skimmed a couple of parts of ANKOC, so can’t conclude yet on it) I have strongly agreed with, but there’s some of the presenting that I react strongly against. And this is the implication that this stuff is new, which is certainly reflected in the title of the new book. Often while reading Brian’s writings, I’ve said in my head something like this, “Brian, you write as if this is a new invention, but these are understandings I’ve heard all my life and my dad preached, and they go back 2 millenia.” We don’t need a new kind of Christianity; we need authentic Christianity. Sometimes that’s been very weak in the institutional church (most of the last 1600+ years, in fact), but there have always been those that held to it. Brian sometimes acknowledges this at least to some extent, but overall he comes across as presenting new ideas. This naturally leads to others thinking he is throwing out the baby with the bath water, even though he isn’t if you read him carefully. He’s more rescuing the baby from toxic substances in the bath water. There is no doubt in my mind that this is a strong factor in the vehemence with which some resist Brian. And it is different when he speaks, because as a person he is nothing like the image people get when they see him as this harsh person recklessly attacking the foundations of the Christian faith. His persona exudes the Christian virtues, but people often don’t get that when they’re reading him with the purpose of examining his doctrinal purity. He’s extremely hard to dislike in person. Is the “neo-emergent” thing tongue-in-cheek and I’m not getting it? If it is, it’s funny. But you seem kind of earnest, so I’m not quite sure whether to enjoy a good chuckle or start rolling my eyes. Thanks for the exposure. I really love this writer….will read. As I’ve noted the bemusement and/or outrage engendered at such placement, I’ve reevaluated. ‘EmergING,’ while existing from around 2005-2008, is definitely dead now. No one (in North America at least) self-identifies that way now. So if Neo-Calvinists are ‘right’ and Emergent is ‘left’ (and I have friends in both camps who would debate this, but speaking in broad generalities), then missional folks would be to the left of the NeoCalvs and to the right of the Emergents – which is kind of like saying missional folks are centrist, yes? Right, Bill (Samuel). I haven’t stopped identifying myself as emerging, as in “emerging/missional” — but I do think there’s something to what Mike is saying in that it’s not dead, but on the decline, used now primarily as a means of distancing oneself from Emergent™. Those formerly identified as emerging for the same reason have probably dropped the label or migrated to missional.